If you haven't checked it out yet, I have a giveaway going on for an Eclos Beauty starter kit. I'll wait here while you go enter. There aren't many entries yet so you have a good chance to win. May is a crazy busy month for us. School finished up for my youngest yesterday and the oldest finishes Tuesday. Today I am going on a field trip to a creamery with the first graders while my mom watches the little one (thanks Mama!). On top of this there are three family birthdays this month. All of this means I really haven't had a chance to write down a new crochet pattern or get my latest craft pictures together. I don't want to leave you without anything today though. With all the running I was doing trying to get things ready for the Princess' birthday last week I hit a yard sale on Friday at my church. I found this for $20. 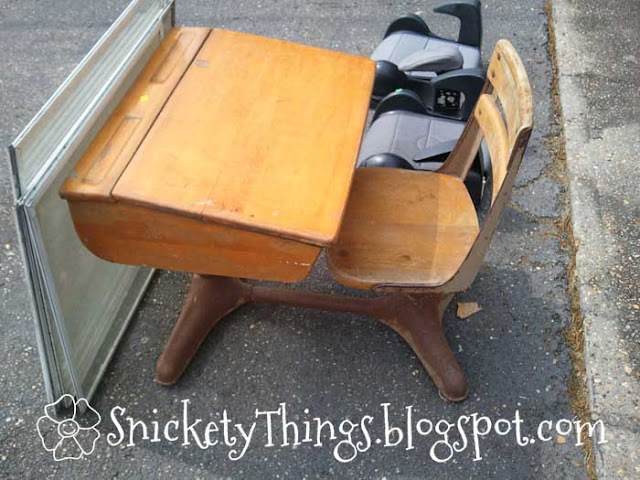 I have been looking for a desk that is small enough to fit in my girl's rooms. The height is adjustable so they can both use it for a while. I am going to try and refinish it. It needs some work where a few screws are missing and it is rusty in several places. I appreciate any suggestions people have on fixing it up. What a cute desk! Rustoleum makes a latex paint called Painter's Touch that is perfect for wooden furniture. It comes in lots of colors and is what I used when I refinished Matthew's desk earlier this year. Just sand it, prime it, and paint it. You could sand down the metal part and paint it a coordinating color. Thanks Chrissie! I will have to check that out. Hope you and the kids are doing well! It was pretty rusty in a lot of places. Still working on it.